Reviewing residential electricity data in Pecan Street’s Pike Powers Lab. Recently, it seems like everyone is competing to become the next big thing in the energy sector. Whether it’s electric vehicles, smart grid technology, or energy storage, innovation continues to pop up left and right as we work to build a smarter, cleaner electric grid. If innovation and technology spark your competitive drive, here’s your opportunity to dive in and join a community of engaged researchers working to solve some of our most pressing energy concerns. 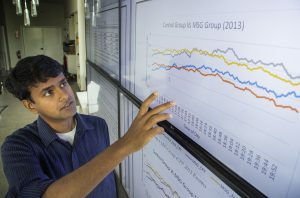 Pecan Street is hosting its second student research competition, inviting the best and the brightest to use the organization’s extensive collection of energy-use data to help solve real-world problems. Open to all full-time graduate and undergraduate students and with prizes totaling $10,000, the competition aims to connect Pecan Street’s well-established dataset with the innovation of young minds. As the grid gets smarter, data can help people play a more active role in how their electricity is made, moved, and used. Competitions like Pecan Street’s will get us there faster. Founded in Austin, Texas with the goal of better understanding the behavior of energy users, Pecan Street’s research network provides the most granular understanding of electricity and water use on the planet. The organization is collecting massive amounts of anonymized data in real time from thousands of houses across the nation, providing a near-constant stream of data on water and energy use. The data collected at these different sites is compiled and made available to university researchers around the world interested in finding out more about the way people interact with the grid. With this information, the possibilities for discovery and innovation are seemingly endless, presenting both a challenge and an opportunity to all interested researchers. understanding how charging electric vehicles at different times impacts the grid. Each suggested topic can serve as a jumping off point for research that can have significant real world implications. While it is recommended that researchers utilize these suggested topics, it is not required. In a previous competition, the student who won first prize used Pecan Street’s dataset to ease the pressure that residential air conditioning puts on the grid. Using a centralized control, the winner created a system to adjust thermostats and distribute use throughout the day. This cuts pollution by reducing the need for costly, dirty “peaker” plants, which operate only a few hours each year when demand is high (like on a hot summer afternoon when many people simultaneously crank up the AC). In a previous competition, the student who won first prize used Pecan Street’s dataset to ease the pressure that residential air conditioning puts on the grid. The opportunity for discovery with this next round of competition grows even larger as Pecan Street expands its testbed and data collection. Visit Pecan Street’s website for more information and suggested research topics. All proposals must be submitted to info@pecanstreet.org by January 30, 2018 to be considered. Four finalists will be selected and flown to Austin to present their research at Pecan Street’s annual research conference, with the chance to win big and get involved with this up-and-coming research community. Smart grid technology is already transforming our energy system, and there has never been a better time to get involved in this fast-growing industry. The future of the national grid may be impacted by the work that comes out of this competition, and you could be influential in the next wave of energy innovation. This entry was posted in Clean Energy, Energy Innovation, Texas. Bookmark the permalink. Both comments and trackbacks are currently closed.